Vinyl banners can be used to make a statement for a low cost. 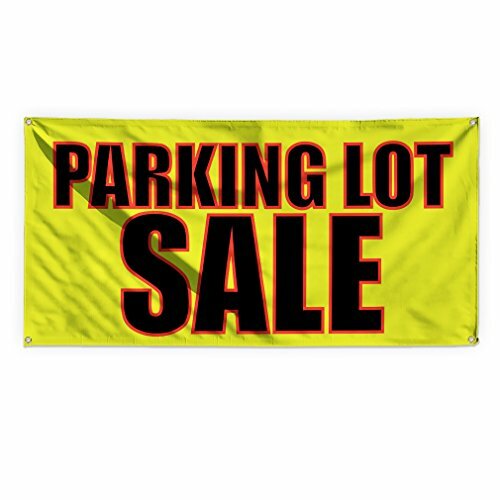 This banner is printed on heavy duty 13oz indoor/outdoor vinyl banner materiaL; printed with UV and water resistant inks, and includes nickel grommets for easy hanging. Full color banners provide the cheapest form of advertising, you can't go wrong with our high quality banners! Professionally grommeted ready to hang! The best prices on Amazon from a company you can trust! We print hundreds of vinyl banners a month! We know Banners! YOU DON'T HAVE TO BE AN EXPERT: Depending on the option you pick, you'll get high quality premium grade exterior/interior 13 oz weatherproof Banner. Professionally grommeted ready to hang! The best prices on Amazon from a company you can trust! We've taken all the guess work out of the equation by providing you with top quality professional crafted banners and signs. All you have to do is to pick the perfect place to display. Highest quality banner available on the market; it look great inside with high quality print. View More In Sign & Poster Kits. If you have any questions about this product by Sign Destination, contact us by completing and submitting the form below. If you are looking for a specif part number, please include it with your message.